The circular symbol in my quilts is my representation of the Medicine Wheel. This symbol, which I use in all the quilts I make, helps me to recognize and be thankful for the gifts of Life which have been given to me. The teachings of respect, the foundation of our Anishinaabe Way of Life, are symbolized by the four colours. 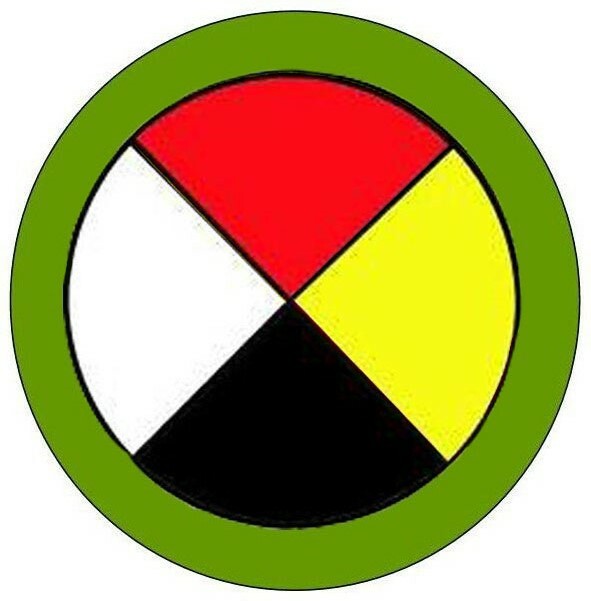 Although this symbol is commonly known as the Medicine Wheel, I prefer to call it the Pimaatiziwin Circle. Pimaatiziwin is the search, the aim, the hope, of living a Good Life on this Earth. The four directions, East, South, West, and North, are represented respectively by the colours red, yellow, black, and white. Within these colours are the four land masses that the Creator gave to the people She created. Turtle Island (North and South America) was given to the Red People, the lands of the Far East were given to the Yellow People,; Africa, Australia, and other islands were given to the Black People, and the European land mass was given to the White People. The Anishinaabe were given these lands to protect and nurture. The colours also represent the four life-givers ~ food, sun, water, and air; the four seasons ~ spring, summer, fall, and winter; the four vices ~ inferiority, jealousy, resentment and greed; and the four moral principles ~ vision, patience, reasoning and caring. From the East we are given the animals, which teach us about sharing. From the South we are given the trees, which teach us about honesty. From the West we are given the grasses, which teach us about kindness. From the North we are given the rocks, which teach us about strength. All things in this Life are given to us by the Mother of us all, Our Mother, the Earth. She is represented by the green (sometimes brown) circle that encompasses the four colours, and all that we experience. 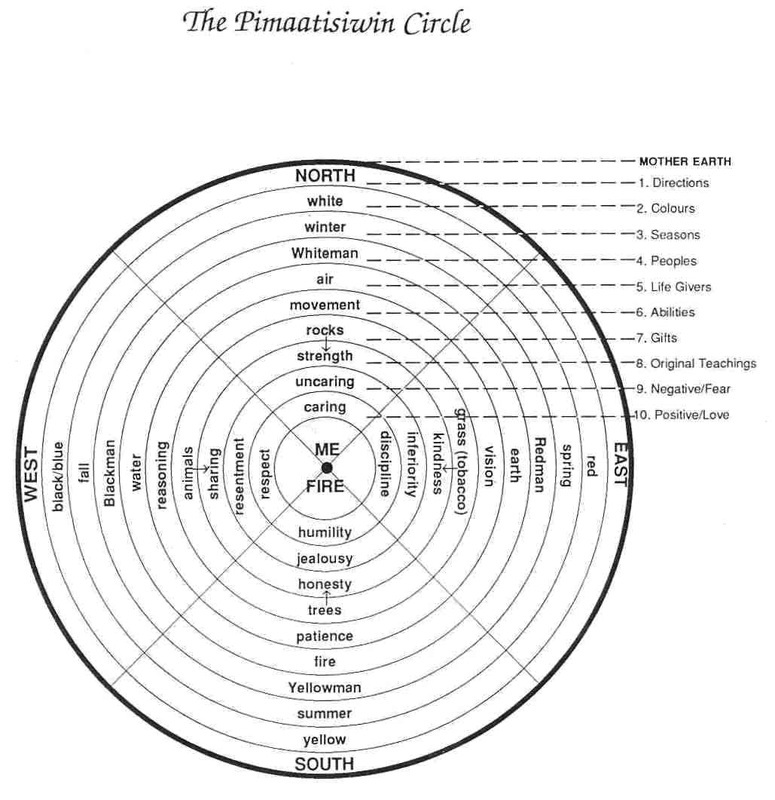 Lines that radiate from the Pimaatiziwin Circle tell us that each Being in the creation affects all that comes into contact with her or him, both physical and spiritual. The center, where all the colours touch, is the Spirit, the fire within each of us. THE CREATOR has given all people knowledge and wisdom, each in her or his own way; no one is forgotten. To our Indian peoples, and to others who live close to our Mother Earth, we are given knowledge and wisdom through dreams, visions, fasting and prayer. We are blessed with the gift of seeing the many lessons that have been put into Nature and the world around us.